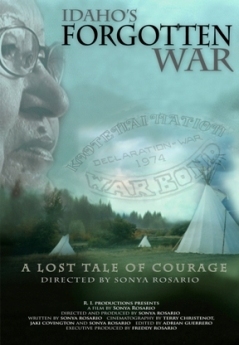 The documentary, “Idaho’s Forgotten War” profiles the courage and faith of 67 Idaho Kootenai people and the extraordinary Kootenai woman, Amy Trice, who declared war on the United States government in 1974 to save her people. Robbed of their lands, culture, and hunting rights, the Kootenai people moved from place to place within a small isolated town called Bonners Ferry, Idaho. Far away from a way of life that no longer existed, the Kootenai people faced complete annihilation. By 1974, the Kootenai people experienced extreme poverty. Homes given to the Kootenai’s by the Federal Government were decaying with broken windows and holes in the roof, providing minimal shelter to their owners. When a Tribal Elder freezes to death on a cold winter’s day inside his unheated home, Amy and her people fear it is only a matter of time before their entire Tribe disappears. The film documents the stories of the courageous young Idaho Kootenai woman and the people who experienced the war. “Idaho’s Forgotten War” will raise awareness about the last American Indian war that was declared against the U. S. Government on Sept 20, 1974. This documentary will inspire viewers to believe in a better way of life and smaller Tribes to remain resilient in seeking Federal recognition for their people. What was once Idaho’s forgotten history comes the true story about a Kootenai woman and her courageous spirit that started a bloodless war and helped the Kootenai people rise out of the ashes to become a prosperous Indian nation. Now get your copy of this historical documentary now! Click on the Ordering Button! © Copyright 2015 Sonya Rosario Productions. All Rights Reserved.